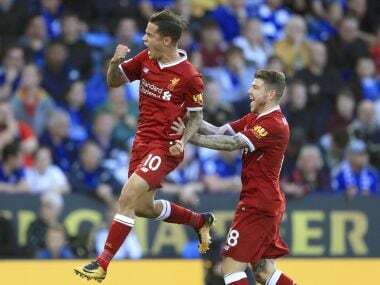 Leicester: Philippe Coutinho marked his first Premier League start of the season with a superb goal as Liverpool returned to winning ways by edging Leicester City 3-2 on Saturday. Coutinho submitted a transfer request on the eve of the season, only for Liverpool to block his move to Barcelona, and he began the atonement process with a glorious 23rd-minute free-kick. 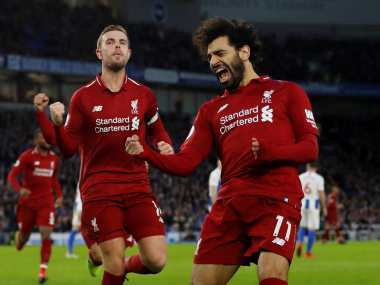 Further goals from Mohamed Salah and skipper Jordan Henderson helped Jurgen Klopp's side register a first win in five attempts and avenge their mid-week loss to Leicester in the League Cup. But victory so nearly eluded them at the King Power Stadium. Shinji Okazaki and Jamie Vardy replied for Leicester and the latter then saw a 73rd-minute penalty parried by Liverpool goalkeeper Simon Mignolet. 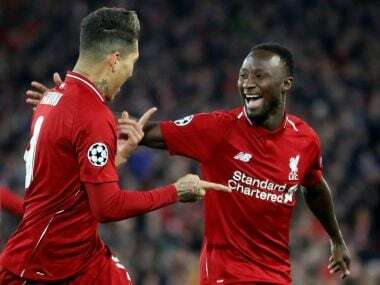 Liverpool climb to fifth place, five points below leaders Manchester City, while Leicester sit 16th, above the relegation zone on goal difference alone. Predictably, Klopp made seven changes to the side that went out of the League Cup earlier in the week, but Coutinho retained his place. Okazaki had shone in Leicester's 2-0 win on Tuesday and was rewarded with a place in Craig Shakespeare's starting line-up. The visitors applied the early pressure, Emre Can forcing Kasper Schmeichel into a save from a narrow angle in the first minute. It was a sign of things to come as both sides enjoyed chances in a frantic opening period. Okazaki set Vardy away down the left flank and although Mignolet could only palm his shot across goal, Riyad Mahrez scooped the rebound over the bar. Liverpool should have taken the lead after Can rattled the base of Schmeichel's post with a 20-yard shot, but with the Danish goalkeeper lying helpless on the ground, Salah contrived to shoot wide. The Egyptian made amends in the 15th minute as he got on the end of Coutinho's cross and powered a far-post header past Schmeichel to open the scoring. The home side came close to a reply three minutes later as Vardy chased down an attempted Mignolet clearance and the Belgian goalkeeper did well to divert Okazaki's shot wide. Instead the visitors went further ahead from Coutinho's free-kick, the Brazilian curling his effort brilliantly over the wall and past the despairing dive of Schmeichel in the 23rd minute. The half ended as it had started with a flurry of chances at both ends. Leicester looked like they had pulled a goal back shortly before half-time as Okazaki squeezed the ball past Mignolet, only to see it ruled out by an errant offside flag. Liverpool were inches away from extending their lead still further when Coutinho came agonisingly close to getting a decisive touch on Roberto Firmino's driven cross. Amid the half's dying embers, Mignolet produced a fantastic one-handed save to push Vardy's header over the bar. 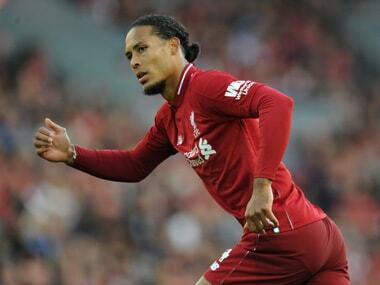 But the Liverpool goalkeeper's inability to claim to ensuing corner, amid suspicions of a foul by Okazaki, allowed the Japanese striker to stab home and give the Foxes a lifeline. Liverpool came close to restoring their two-goal cushion soon after the restart as a dangerous attack ended with Coutinho driving a shot into the grateful arms of Schmeichel. The visitors continued to press, Firmino ballooning a header over from close range. 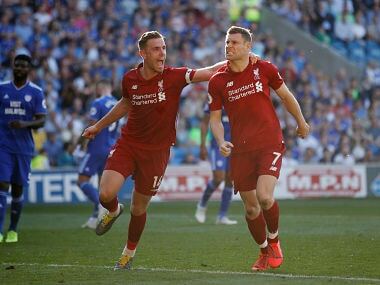 Liverpool finally got a third from a devastating counter-attack that saw substitute Daniel Sturridge feed Henderson, who cut inside before wrong-footing Schmeichel. The two-goal advantage only lasted one minute as Mignolet parried Demarai Gray's shot into the path of Vardy, who headed home from beneath the crossbar. Leicester could have drawn level after Vardy raced into the box and was clattered by Mignolet, who also managed to graze the ball. Referee Anthony Taylor pointed to the spot, but decided the challenge only warranted a yellow card. Mignolet made the most of his reprieve by guessing correctly to deny Vardy from 12 yards and stop the Leicester striker scoring a third penalty in successive matches.